Currently the Managing Director of Z80 Labs, a $6.6 million tech seed fund and accelerator. I have written for TechCrunch and contributed to ReadWriteWeb and VentureBeat. I have been mentioned in CNN, Wired, Business Week, MediaPost, Barron’s, Mashable, and VentureBeat. My past 9-lives (outside of my own startups) include bizdev & sales roles at web tech firms, along with a Management degree from Purdue University (Go Boilers!). I have lived in many places, but am settled in my hometown of Buffalo, NY where it has been a painstaking road to win a national sports championship (although we’re excited the “Pegula era” is ahead of us with the Sabres). In my spare time I enjoy going to concerts, watching College Gameday on Saturdays in the Fall, drinking fancy beers, traveling the world and tasting awesome foods around the world with my wife Caryn. I was once a (marketing) roadie for a few weeks for the band Earth, Wind & Fire. 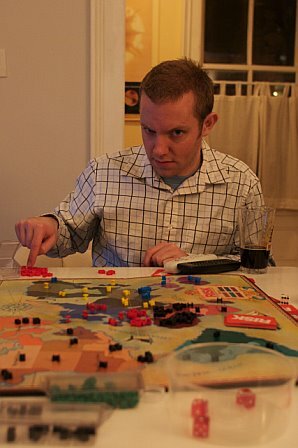 I play Monopoly, Settlers of Catan, Risk, Blokus, Chess, and Bridge. I bring it. I play Bridge only a couple times a year these days, when I visit my Dad. I’m rusty on Chess, but came in 2nd place at a regional North-East Math Team meetup when I was in highschool. Blokus – I will rock you. Monopoly – my friends and I have a standing annual game during Thanksgiving – I’m the reigning champ 3-years in a row – talk about a turkey. Risk – I go for Australia, then for the jugular. I’m involved in the local tech scene, having co-founded BarCamp Buffalo and a weekly geek meetup on Tuesday mornings (swing by!). A couple years ago I knew New Year’s Eve in Buffalo has sucked for awhile, so I took it upon myself and my company threw a 500-person New Year’s Eve party — sold-out and then did it again the following year (it was the last public event at the 86-year old historic Statler Towers Hotel). Read my other start-up related posts.